With the help of our vendors, we are engaged in providing a qualitative range of Surface Grinding Vices to our clients at reasonable prices. Our range is manufactured using best grade raw materials and is sourced from certified vendors in the market. These are highly appreciated by our clients for smooth finishing and durability. We deal in Grinding Vice Pin Type that comes with an alloy steel body and a jaw plate. It is provided with a movable jaw, which pushes the job at 45 degrees, thus, offering higher clamping force that helps in easy lifting and tilting of jobs. We manufacture this pin type grinding vice from quality grade raw materials that ensure a long shelf life. 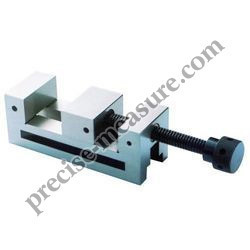 We are offering hardened and ground precision grinding vice that are manufactured from top quality materials in accordance with international quality standards. We also offer customized facility for these as per the specifications of our clients. These are available at most competitive prices. 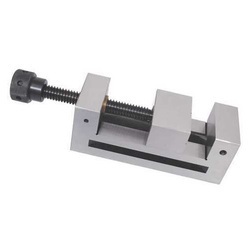 Dimensionally Smaller than conventional Vice . All sides are at Right angle to each other . It is used where precise holding is crucial. Grinding Vice of OHNS material with 0.006 mm accuracy upto 100 mm. available in standard sizes 80 mm , 100 mm , 125 mm . order of bigger size also available. With the constant support of our expert team, we are engaged in offering a huge assortment of toolmaker's grinding vice pin type. This toolmaker's grinding vice pin type offered by us is available as per the diverse application requirements of our international clients. Owing to their quality features, this toolmaker's grinding vice pin type is extensively appreciated in the industry. Under the meticulous supervision of our skilled professionals, we are providing a high quality range of Grinding Machine Vice.